The best Aquamarines come from Brazil. Other sources include the Soviet Union, the U.S. (it’s Colorado’s state gem), Madagascar, Afghanistan, Pakistan, Nigeria, and India. Aquamarine is a 7.5 to 8 on the Mohs scale of hardness (1-10), making it fairly durable for use as jewelry, including rings, pendants, and earrings. It’s the typical birthstone for March. Brazil in 1910 claims the largest Aquamarine ever found — a 243-lb. stone that was cut into smaller stones and yielded more than 200,000 carats. Ancient peoples viewed Aquamarine as the treasure of mermaids; today, it still protects all who travel near water. Aquamarine is associated with the apostle St. Thomas, who traveled the seas preaching the gospel. Roman doctors used it to treat overeating. Aquamarine beads were found in Egyptian mummy-pits; ancient Greeks used it for intaglios; and the shoulder stones of the High Priest of the Second Temple were said to be Aquamarines. Emitting a gentle energy, Aquamarine fosters tolerance, negotiation, and natural justice. It’s believed to encourage a lover to return and is often given in eternity rings to boost fidelity. Aquamarine has a rapport with sensitive people, clearing confusion, fostering self-expression, and soothing fears. It’s believed to be protective during pregnancy — for both mother and baby — and it lessens overreactions like allergies. 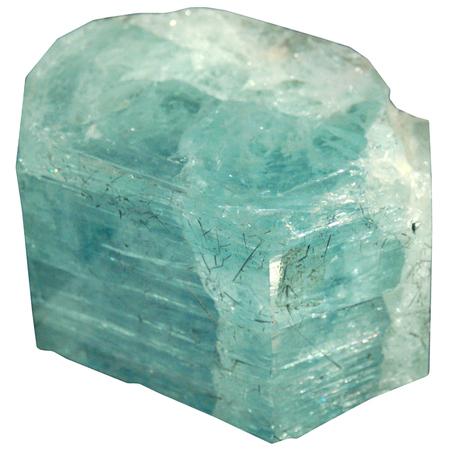 Metaphysical healers associate Aquamarine with the Throat Chakra, helping overcome the fear of speaking and boosting conviction in articulation. Feng Shui experts see Aquamarine as water energy, yeilding yet strong. Traditionally associated with the north area of a room or home, water energy can enhance any room where you rest or meditate. An excellent stone for meditating and quietening the mind, Aquamarine is useful for laryngitis, sinus conditions, allergies, sore throats, and gum problems. Ancients used it for fluid retention and eye diseases. 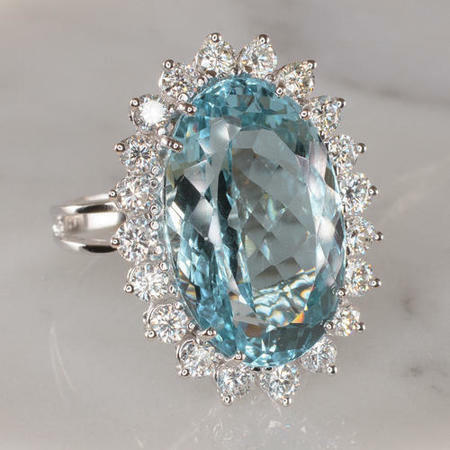 Writers in the Middle Ages said Aquamarine was a popular oracle for fortune-telling as well as an antidote for poison. Clean your Aquamarine with warm, soapy water; avoid harsh chemicals and ultrasonic cleaners. Aquamarine can fade in sunlight — you’ve been warned! This entry was posted in Sunday's Gem and tagged Aquamarine gemstones, Aquamarine properties, healing gemstones, metaphysical healing. Bookmark the permalink. My mother’s birthday was in March, and she had a beautiful acquamarine ring. After her death, I gave it to one of my cousins, who promptly lost the stone from it. I can’t even tell you…. No more rings to the relatives! It is beautiful. The uncut chunk you’ve shown looks remarkably like the blue ice we saw in glaciers when I was in Alaska. Much of the ice there was white, or grayish, but the blue was much like that — frozen aqua marine! Oh, dear, your story confirms what I’ve been taught — that folks who don’t *work* for things never truly appreciate them. I can see where you’d be reluctant to gift jewelry to this particular relative again! Blue ice? I’ve never heard of that, but I found this gorgeous photo (https://www.freep.com/story/money/cars/2018/03/16/blue-ice-mackinaw-city/426202002/) of some blue ice up north, and I’m still shaking my head. Who knew?? Must be especially striking when seen in person! Debbie, it’s so ironic that you posted about this gemstone because only a few days ago I was assisting a customer with something in our store and I commented on how beautiful her ring was, and she told me it was AQUAMARINE. Both the stone and setting were stunning. She told me that she purchased it in Arizona. I love the color of Aquamarine because it’s a combination of pale blue and green – like the color teal. Yup, you are spot on. And being a Reiki practitioner, I will often meditate (and visualize) blue in my throat area before speaking in front of a crowd if I feel nervous. It really helps to speak clearly and with confidence. Love the photograph of the ring. Gorgeous! Thanks for yet another informative gemstone post, my friend. Enjoyed it! Have a fabulous Sunday and Happy Belated St. Patrick’s Day! I think the color is fabulous, too, Ron. It’s a mix of my two favorite colors (blue and green), and it’s just stunning. Thanks for confirming my research about Aquamarine being such a good meditation stone, especially for the throat area. I hadn’t thought of using it that way, but I’ll bet the results are impressive. And who wouldn’t love to just sit and hold one of these beauties?!? “Water of the sea” how lovely. And I love the color. Blue or green it seems like a good gem for St. Patricks day weekend. Especially since Mermaids are known to be tricky. I have an Aquamarine ring that I don’t wear often but since I am suffering a cold I think I’ll put it’s magic to work. Thanks for the tip! Luck of the Irish to you! And as Nana always said (along with many others): May you be in heaven 7 days before the devil knows your dead! Aquamarine is Domer’s birthstone, not that he really cares. I think it’s stunning. Several years ago, I toyed with the idea of acquiring some for myself and invested in a pair of Aquamarine earrings. Nothing near as impressive as the ring pictured here though. Did you go see the River being greened? Domer refused to go. Said when you’ve seen it once, you’ve seen it enough. He’s such a wet blanket! If I’d been up there, I’d have dragged him to see it anyway. Luck of the Irish back atcha! I didn’t realize these would fade in sunlight either, FF. I learn something new from every one of these posts. I imagine jewelers shudder at the thought of beautiful stones they’ve sold being worn while playing sports, while cleaning house, and being stored with other jewelry where they can rub and scratch! I enjoyed learning about the Aquamarine, Debbie. Thank you. Thank you for reading it, John. It’s a lovely stone and is Domer’s birthstone. He doesn’t have any, nor does he want any! He did, but he chose the ND blue sapphire. Looks very nice, too! Beautiful and my husband’s birthstone! It’s Domer’s birthstone, too — they’re lucky fellas! !